I'm trying to start going to fabric stores that are not Joann Fabrics. Because Joann Fabrics is kind of lame. I just found Sally's Fabrics, in the Fox Hills Mall. There is also a Sally's in the Fashion District, but it is so much easier to park here. They are in the process of moving right now, so everything is 30% off. Which means I spent way to much $$ in order to spend less, sometime in the future. Very sensible, yes? 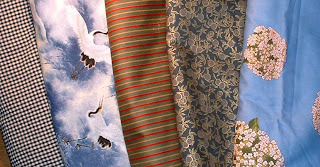 There are a lot of really nice fabrics here, but not much else. This is a fabric store, not a craft store. The sale prices are great. Unlike Joann's, they have a lot of "real" fabrics - nice linens, silks, and soft cottons for reasonable prices. The staff is friendly and fast. And I like that it is in the same mall as Old Navy, JC Penney, and Forever 21.